I mentioned in the last post that one of the only things Leopold has every really destroyed was his sweater. 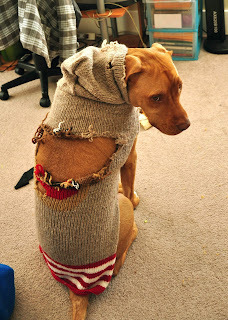 I bought it for him because he doesn't have enough fur to be outside long in winter; I never thought I'd be the type of person to dress my dog in a sweater, but a girls got to do what a girls got to do to keep her dog warm. 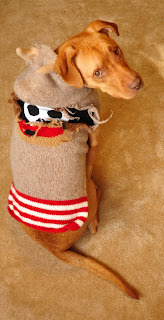 I decided to buy him a sock-monkey sweater because, well, he just looked so darn cute in it. It was a little pricey for my wallet, but cuteness triumphed. And... then I accidentally left it down too low, went out for a bit, and returned home to find that Leopold had torn off all the "cute" parts of the sweater (ears, monkey face.... all gone). 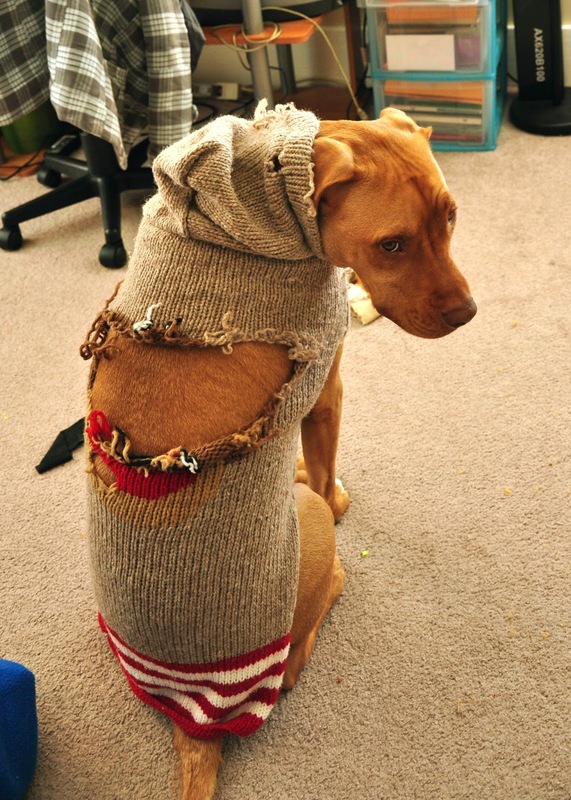 I was sad, and angry at myself for leaving the sweater down where Leopold could get at it. What a waste of money! I couldn't bring myself to throw the sweater out, so I decided to "fix" it. I replaced the lost monkey ears with monster horns, and filled in the missing monkey face with a monkey skull. One cute monkey sweater bit the dust. One punk monkey sweater is born. Leopold is usually pretty good about not ruining my (or his) stuff, but every dog has his day. and I've learned that living with dogs means that you've got to accept that sometimes stuff gets ruined because there is only so much you can do to prevent it from happening. I'm happy that I was able to turn this particular ruined garment into something functional and funky.